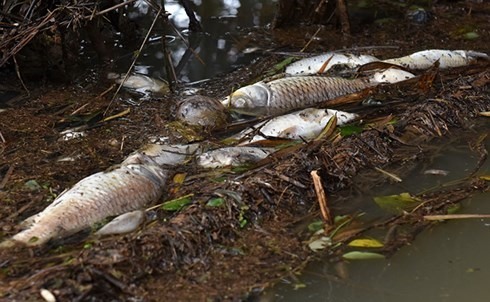 In the last few days, a large amount of fish died en mass along the Phu River in Tu Nghia District, the central province of Quang Ngai. The dead fish, lying along more than 3km of the river, left a bad smell and local residents worried. Nguyen No, a resident of La Ha Town, said that during the past three days, his family fished out a number of bags of dead fish from the river. “The dead fish have different sizes, from as large as my hand, to as small as my finger. Dozens of ducks ate the dead fish and they also died,” he said. Local residents said that it was the first time the fish had died en mass in the area. Tran Thi Pha, a resident in La Ha Town, who has worked there for 15 years, said that so far many kinds of fish lived in the river. However, in the past years, the river’s water had turned turbid and the number of fish had gradually decreased. Pha and her husband temporarily stopped their work since the fish died, as they were unsure of the reasons for the problem. Ton Long Nghenh, head of the Tu Nghia District Natural Resources and Environment Division, said that the division on Monday checked the scene. The division sent a report to the provincial Department of Natural Resources and Environment, and the Department of Animal Health. The district would set up an inspection team to check the riverhead, said Nghenh.